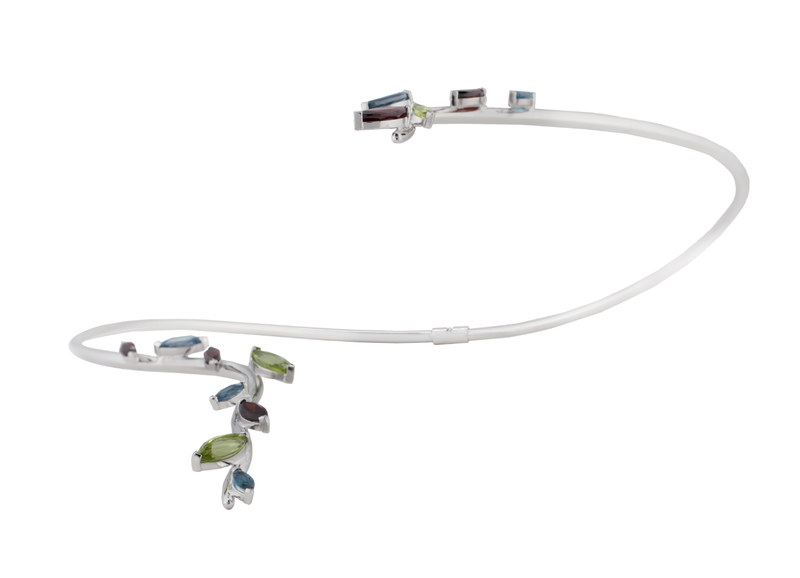 The extravagant and endlessly elegant choker is part of the twigs collection, which is inspired by nature’s diverse beauty, concentrated on an abstract interpretation of a tree’s twigs. 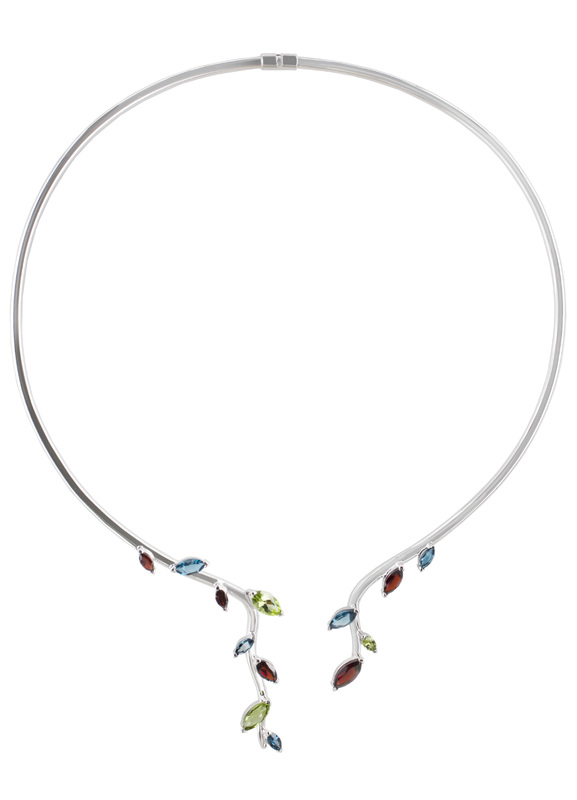 The elegant marquise shaped stones garnet, olivine and topas are naturally spread over the choker’s front part and make a charming addition to the décolleté. Due to the especially developed hinge-joint, it has a stable fitting and suits perfectly. The choker is the ultimate signature piece and the perfect finishing touch to evening looks. 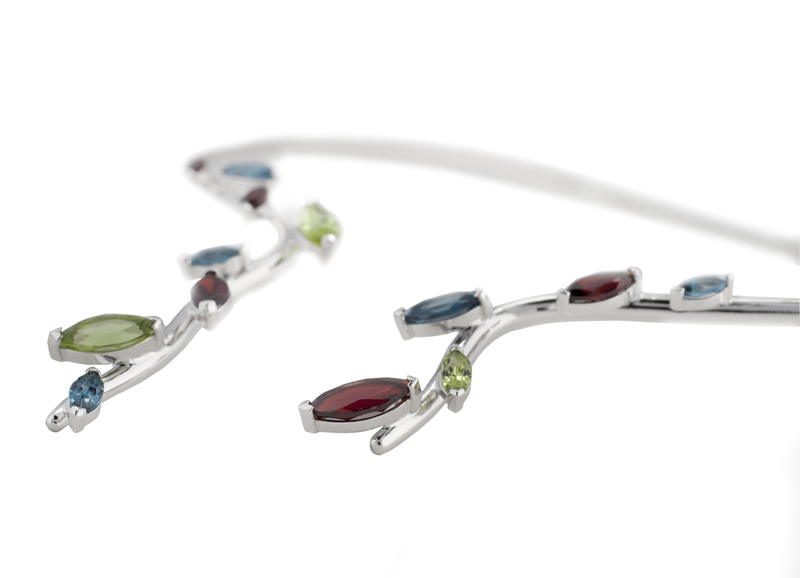 MATERIALS Rhodanized sterling silver Stones: London blue topas, green olivine, red garnet MEASUREMENTS The inside diameter is appr. 13,5cm, it can easily be opened and closed by the especially created hinge-joint The choker has a width of 4mm, the left drop is 4cm and the right drop is 2,5cm Stones in different sizes CARE The silver is rhodanized to protect it from oxidation, to keep the beautiful shine and make it more resilient against scratches. Anyhow, this delicate piece of jewelry is made of precious materials, which deserve a careful handling. Stones and silver should be protected against any kind of chemicals, including soaps. The jewelry should be stored seperately to prevent it from scratching, the best is to keep the jewelry in the original box after wearing.